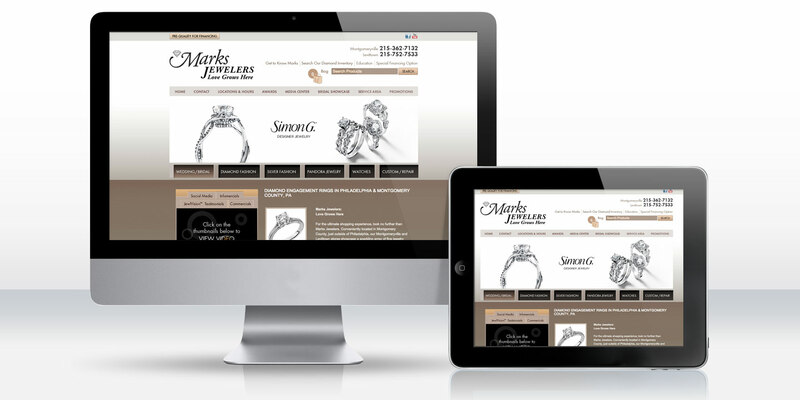 The website for Marks Jewelers is now as elegant and timeless as the fine jewelry they offer. For a company that provides a wide range of diamond and silver fashion, they need an online presence that really shines. In 2005, Marks Jewelers utilized DDA’s website design and development services, and when it was time to update the website in 2011, DDA offered their custom website redesign services to keep the site looking fresh and in line with current technology. With such a large selection of jewelry, DDA had the monumental task of providing optimized and localized content in order to fulfill the proper search engine marketing and optimization guidelines. This wasn’t just to be a comprehensive website of all Marks Jewelers has to offer. It needed to convey an air of high-end quality jewelry and exceptional customer service that buyers expect to receive with a product of this caliber. In keeping with the most up-to-date technology, this site also needed interactive features, such as an eye catching presentation screen and embedded video, to grab and keep a visitor’s attention. DDA first designed and developed a website advertising the services of Marks Jewelers in 2005. Using rich colors, product photography, and custom programmed features, DDA built a site showcasing what Marks Jewelers had to offer. Then, in 2009, DDA added on a dynamic product showcase, complete with 360-degree product videos, pricing, and an easy-to-use navigation structure. Call to action features included a share with friends mechanism and a contact a sales associate command. Additionally, a recently used items tool keeps a running tally of all viewed items and a comprehensive custom administrative back-end makes managing products an efficient process. One of the many unique features of this site is a Wish List, developed by DDA's website programming department, which allows users to create an account with the site and add merchandise to a personalized list. A link to the Wish List can be shared with friends or users can search the website for the Wish List’s author or title. Purchases can be made from the Wish List, and once a user has done so, that item is marked as fulfilled. The Marks Jewelers website succeeds in informing prospect clients of their industry-leading services and inventory. With two locations and a friendly staff, Marks Jewelers has been voted "Best Jewelry Store" five times by the Buck's County Courier Times in Pennsylvania. As a growing business, Marks Jewelers understands the importance of keeping their web presence current, so in 2011 the site was updated once more with a fresh design and updated product information. Flash programming is used in a product presentation highlighting the designers and services Marks Jewelers is known for.